Habitat: The plant is native to Europe, western Asia and North Africa. Description: Caraway is a biennial plant, grows up to 80 cm in height. It has a thick root and smooth, furrowed stems. Leaves are feathery, finely divided. 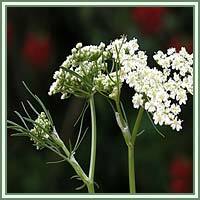 Umbels of white to pink flowers appear on the flower stems, 40-60 cm long. Fruits are brown, ribbed and crescent-shaped. They have an aromatic odor when bruised. 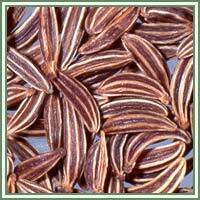 Medicinal use: In addition to its use as a spice, Caraway has numerous medicinal properties. It is most commonly used in cases of gastric problems, flatulence and indigestion. It has been very efficient in relief of flatulent colic in infants. Bruised fruits can be used to ease the earache. It can also be helpful, in combination with other herbs, in soothing of sore throat and laryngitis. Caraway oil can be used in treatment of eye infections, toothaches and rheumatism.